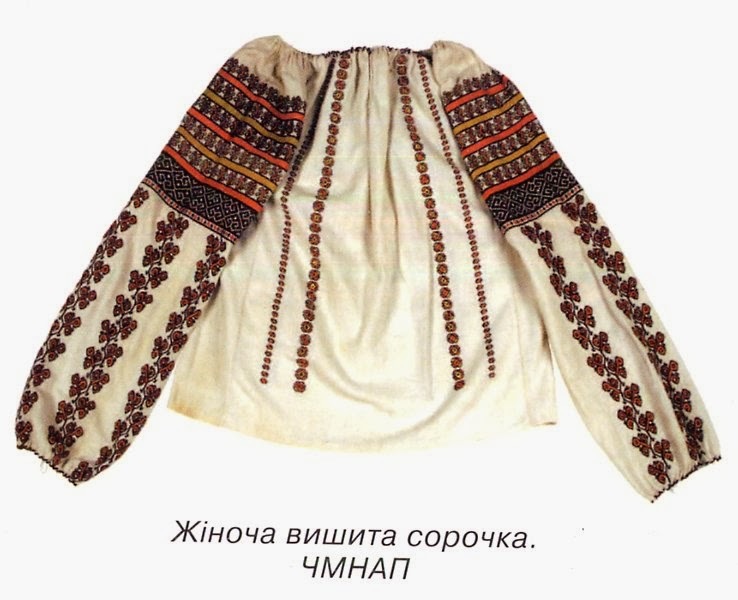 I received a request for more information about the costume and embroidery of Ukrainian Bukovyna. I had not yet gotten around to writing about Bukovyna, although I had certainly intended to. 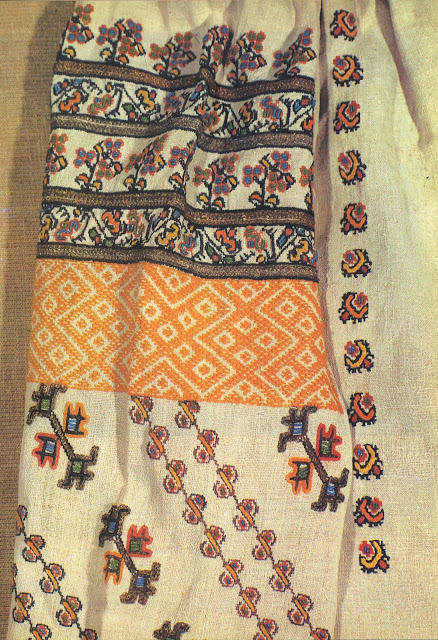 Bukovyna is well known in Ukraine for the complexity and colorfulness of their embroidery, as exemplified by the image above. Bukovyna was established as a province by the Austrian Empire. It is currently divided into two parts, the north held by Ukraine and the south held by Romania. This border imperfectly follows the native population. There are still some Ukrainians south of the border and some Romanians north of it. Here is an old ethnographic map of the Austrian province. An Austrian man by the name of Kolbenheier went around collecting embroidery samples at the turn of the 20th cent. and published them in 1912. This work was republished in Canada in the 1970's, and today is available on disc. Both Ukrainian and Romanian communites are well represented in this work. It is possible to distinguish 4 overall styles of embroidery from his work, apart from some exceptional traditions of individual communities. IV Western, [plates 62 - 74] which is completely Hutsul and consists of the highlands in the counties of .Vyzhnytsia, Radiwtsi (part) and Cimpulung (part). It is well to remember this when accessing this book, which is an extremely valuable resource. 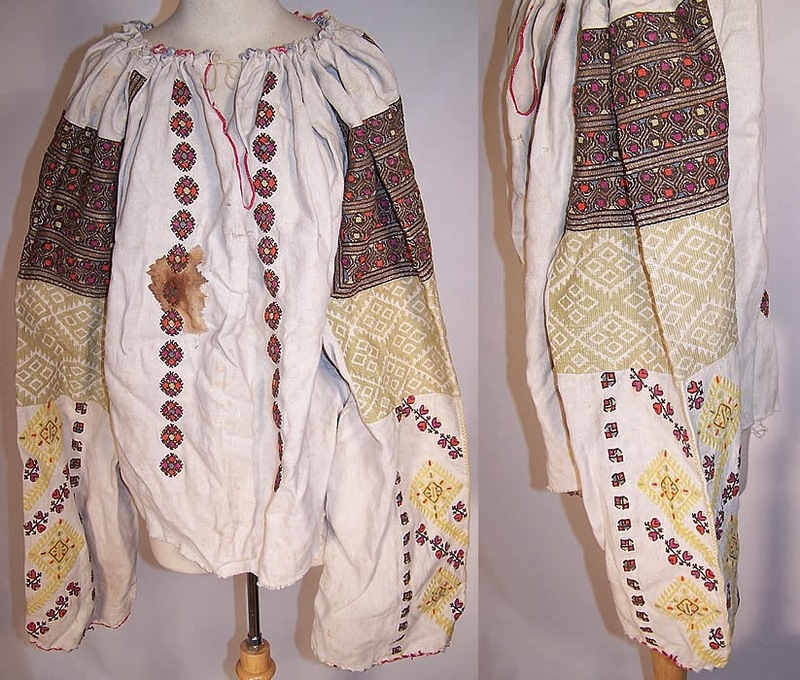 The costume of Bukovyna is more complex than is generally thought, although the same could be said of most costume traditions. 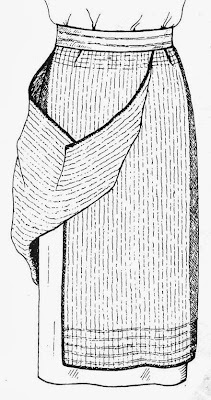 Generally speaking, the costume consists of chemise, wrap-around overskirt [obhortka, horbotka, opynka, fota] a sash which holds the overskirt in place, and a headdress of some kind. 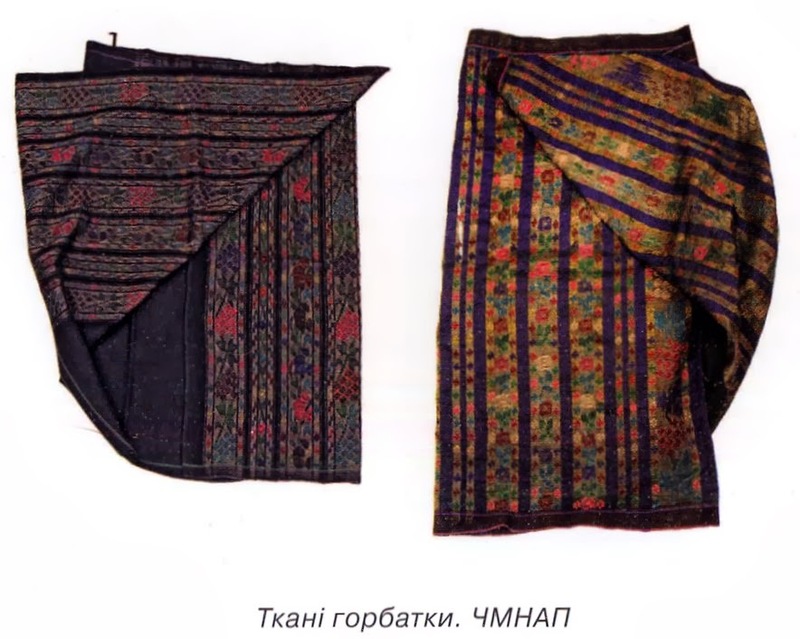 The overskirt 'obhortka' consists of a rectangular piece of heavy home woven cloth with stripes at the top, bottom, and both ends which is wrapped around and overlaps in front.The background color is black and this garment varies little from that used in Podillia, except that the woven in designs tend to be more complex and colorful and may include metallic thread. This is usually worn with one or both corners tucked back into the sash. Morshchanka or 'gathered' cut. 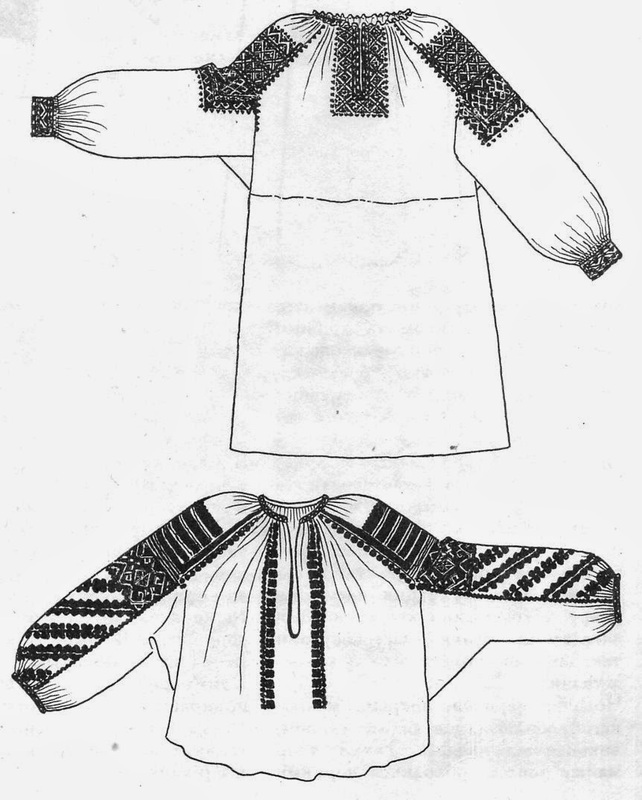 these show Pokuttian and Podillian embroidery, but the basic cut is the same. 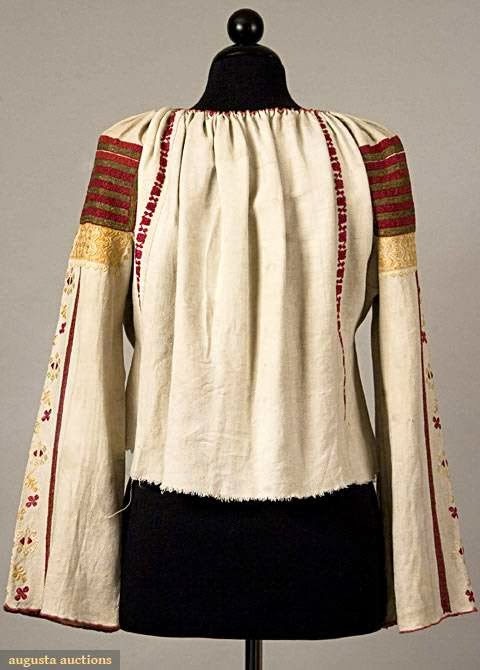 These have an inset, 'ustawka', which is sewn to the sides of the body fields of the chemise, instead of the top, as they are further north. Thus the neck opening consists of both body fields as well as the tops of the shoulder insets, 'ustawky'. The center of the sleeve is sewn to the bottom of the inset, and the sides are then sewn to the body fields. the sides of the sleeve pieces are sewn to each other, with a gusset inserted at the point where they join the body. Untill the 1950's or so, all chemises were made long, although the bottom part was often made of a coarser weave. Some had a collar band, but others were just gathered on a string around the neck which was then used to tie the front opening shut. You can see both versions above. This cut resulted in some restriction of movement, which was fine for formal and ceremonial occasions, but for work and everyday, women used a cut which was similar to that of the men's shirts. 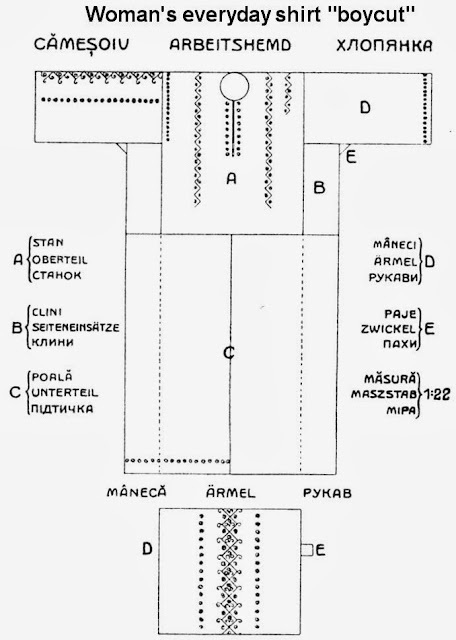 This was known as 'khlopianka', or 'boycut'. 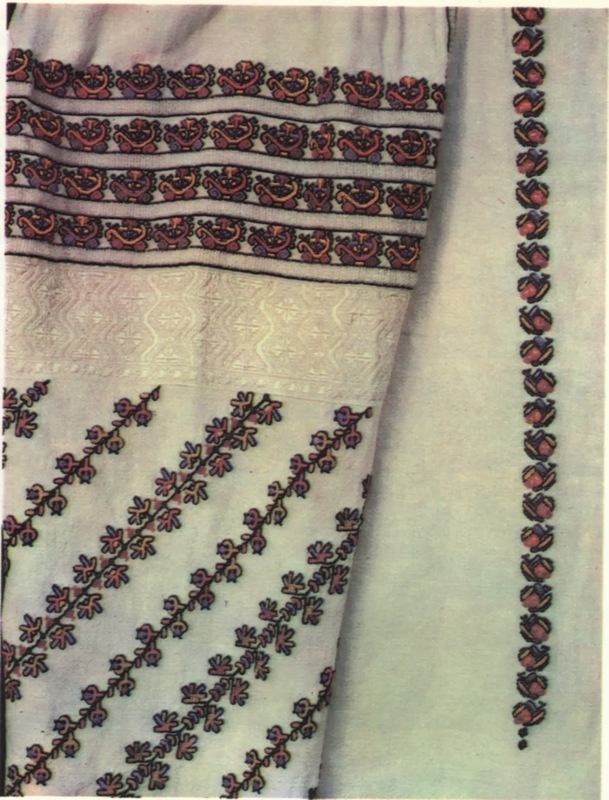 Take another look at the image from the top of the article, and you will see the three part embroidery which is so typical of this entire area. Here is another. These are both morshchanka type, to which I will devote the remainder of this article. I admit that I like this type better, and i think that it should be made more often today. 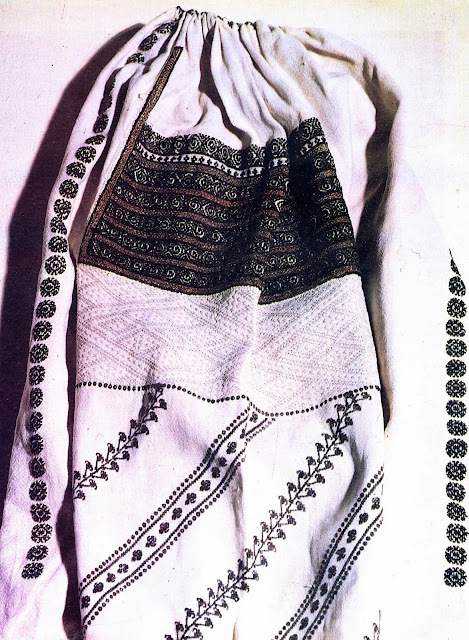 The shoulder inset 'ustawka' receives the first or top part of the embroidery along its bottom edge and extending perhaps halfway up. 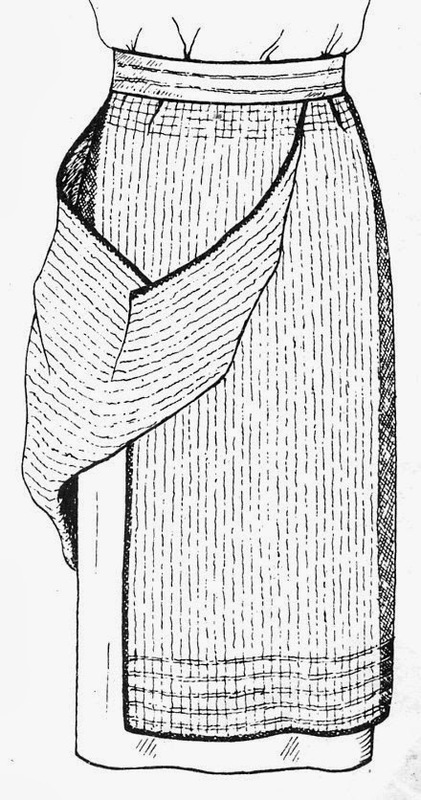 The second part, which is usually monochrome, is executed along the top edge of the sleeve, so that the seam between the two pieces is between these two pieces. 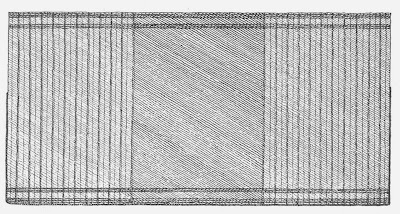 The third part of the embroidery conists of the vertical or diagonal stripes which cover the rest of the sleeve. Generally the part of the sleeve next to the body is not embroidered, because it does not show. The top part of the embroidery usually consists of small motifs arranged in rows, separated by lines of cross stitch or braid stitch, often with rows of chain stitch inbetween, either in colors or metallic thread. 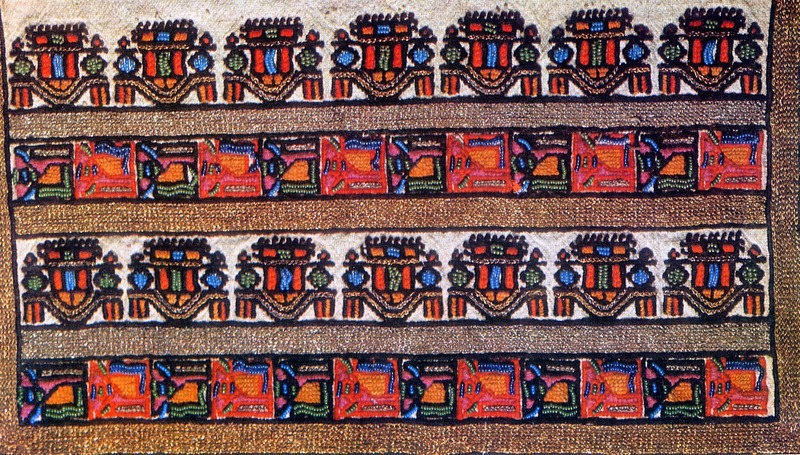 Sometimes, as in this example above, most of the embroidery is in black and metallics.but more commonly they are very colorful. The Bukovynian women refer to the embroidery of the Podillians just to the north as being 'sad', because it is almost completely black. 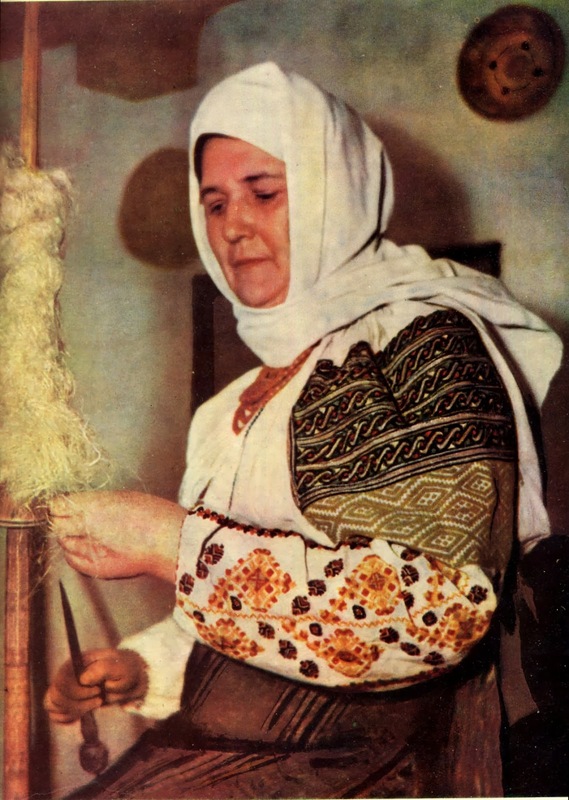 Oddly, the same is true of much of the embroidery of the Romanians to the south, although the two styles are very different. There are usually vertical rows of motifs embroidered on both the front and back of the chemise top. 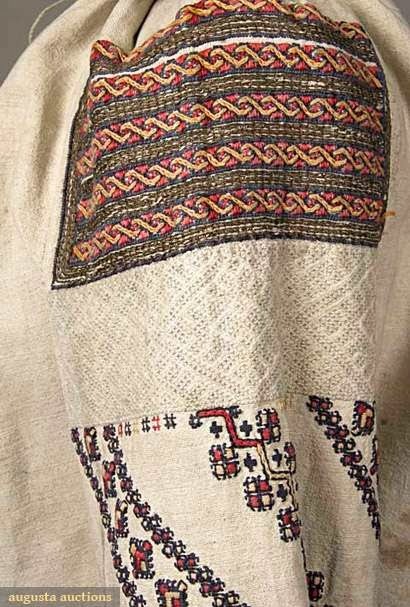 This chemise top is from the north around Zastawna, where the middle part of the embroidery is often extremely wide, and the bottom part often forms one large vertical 'tree' with narrow rows of motifs on either side. As you can see, the techniques used are a mix of cross stitch, outline stitch, flat stitch, chain stitch, hem stitch, seed beads and even sequins. 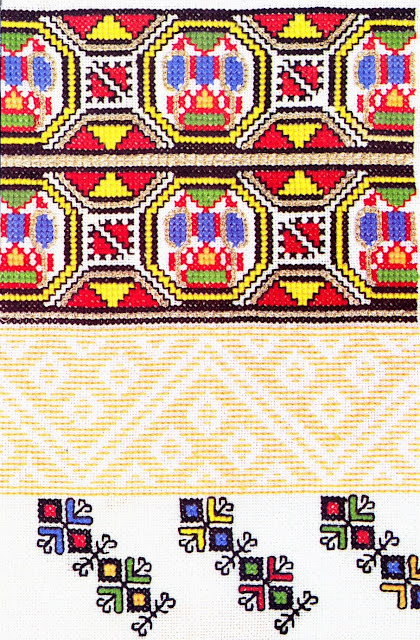 In Zastawna, the motifs on the top part are sometimes exceptionally large. 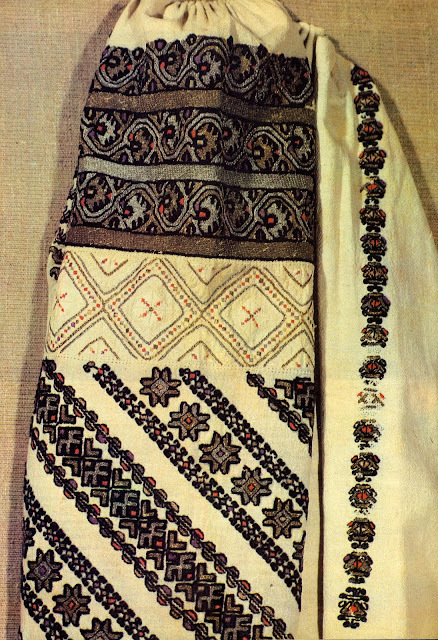 The central part of the embroidery varies, but is most often done in a stitch called poverhnytsia or morshchynka. This consists of columns of horizontal flat stitches. There are two ways of executing this, either bringing the thread across diagonally to the same side of the next stitch, or bringing the thread straight down so that each stitch in a column is made in the opposite direction. Here are examples of both, front and back. The one example has skipped every other thread so as to make the stitching clearer. 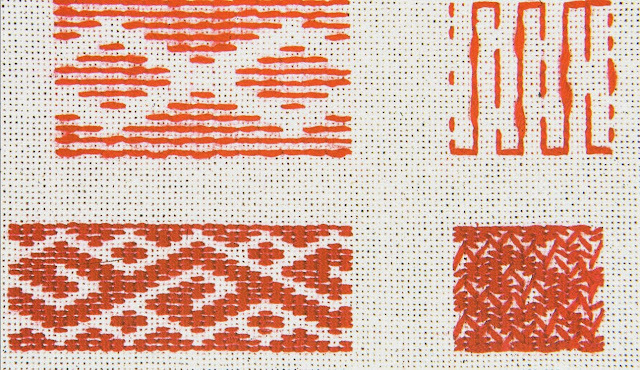 Sometimes other techniques are used for the middle embroidery, but it always forms a contrast to the rest of the composition. In this case being whitework with spots of other colors. The bottom part of the embroidery usually consists of two different diagonal designs which alternate. Take another look at the various images in this article. As in the rest of the Carpathian area, sheepskin vests are also worn here. 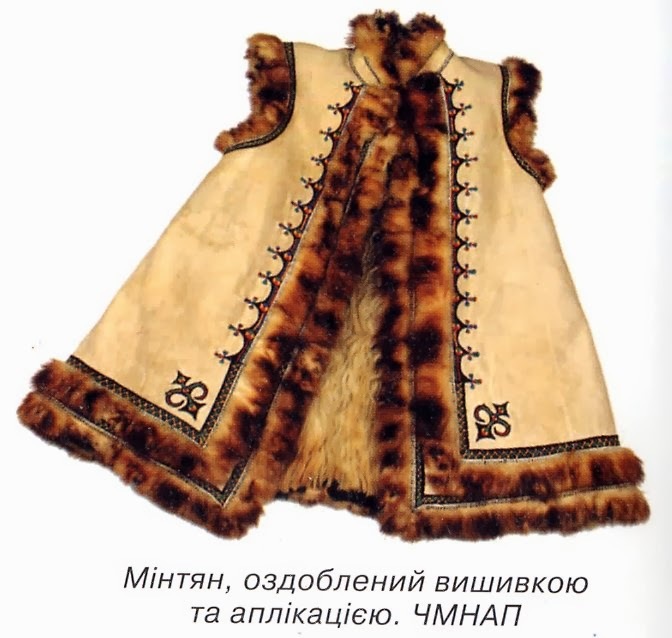 Both hip length vests not dissimilar to the Hutsul style 'kozhushok' or 'keptar' and also longer ones are worn. The longer ones are called mintian, and are cut on an angle so as to flare towards the bottom. Uniquely, in Bukovyna the edges of both are often edged not with lambswool, but with the fur of the European polecat [Mustela putorius]. Here are a couple images of the mintian. 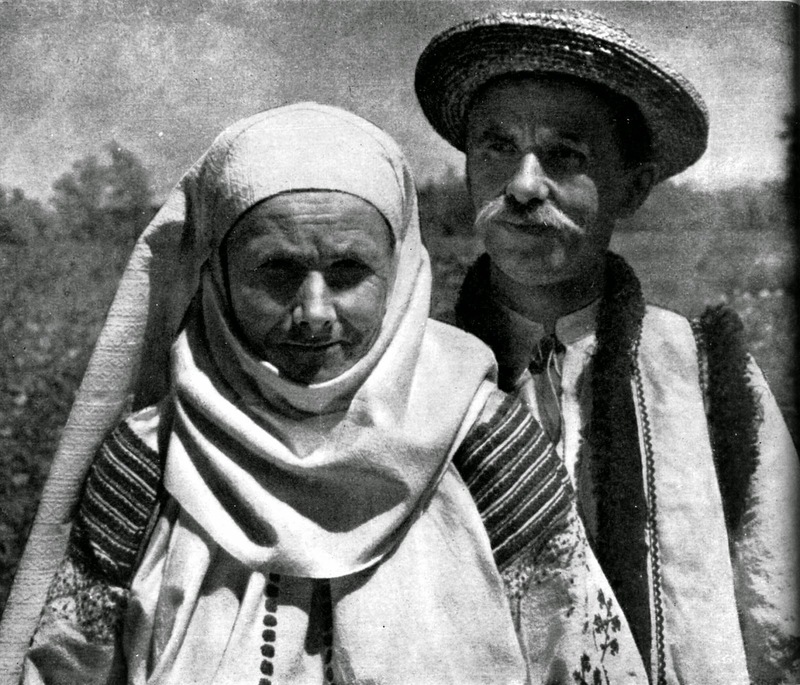 Married women wear a peremitka wrapped around the head, sometimes over a fez-like cap. In Bukovyna, this often has a design woven into the linen of which it is made. 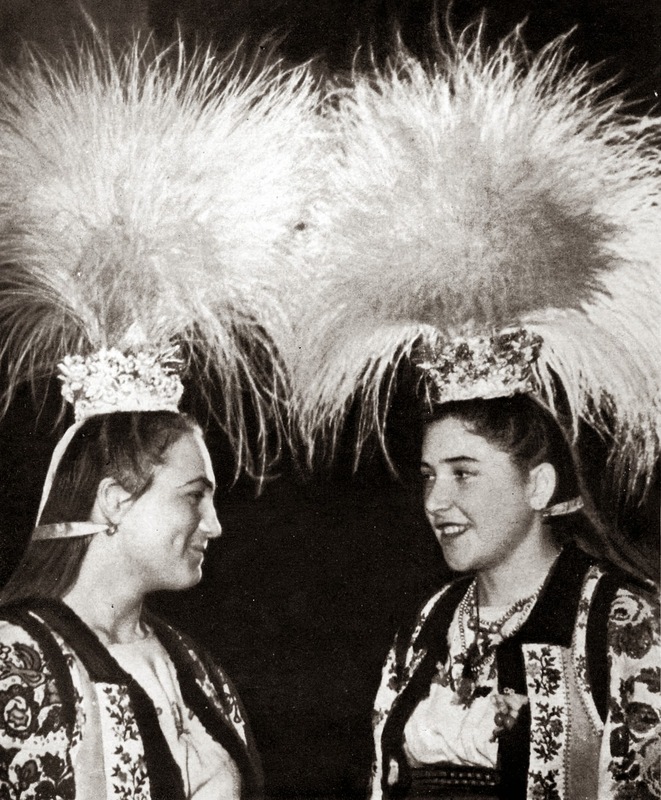 Single girls often wear a cylindrical headpiece called 'karabulia'. This can be decorated in many ways, with paper flowers, beadwork, ribbons and other items. One of the most unique features of the karabulia is that it is often decorated with the feathery seed heads of a local type of bulrush. These move in the slightest breeze and provide graceful movement to the headdress. This is where I will stop for today. I will continue discussing variants of the Bukovyna costume in another couple of articles. wonderful, exhaustive description! 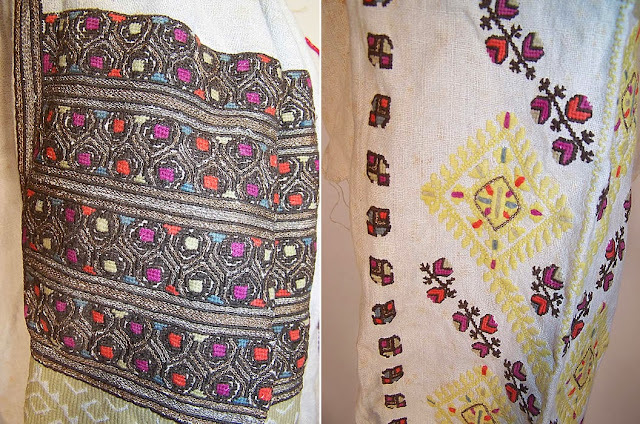 would it be possible to send you a photograph to identify the origin of embroidery? I have two very old folk shirts, I wonder where they come from and whether they are authentic. And embroidery on her chemise - do You think it may be what You described as poverhnytsia or morshchynka? Or maybe something completly different? No, the Wallachian [=Romanian] woman is wearing a double apron. That is, two panels of cloth, one of which hangs in front, and the other behind. The embroidery could be almost anything. 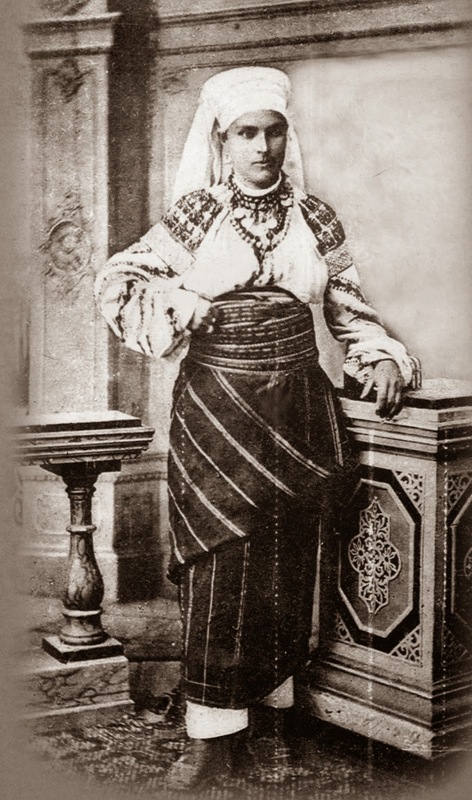 This type of costume is typical of the Romanian costumes of Transylvania. [see my article on Transylvania]. 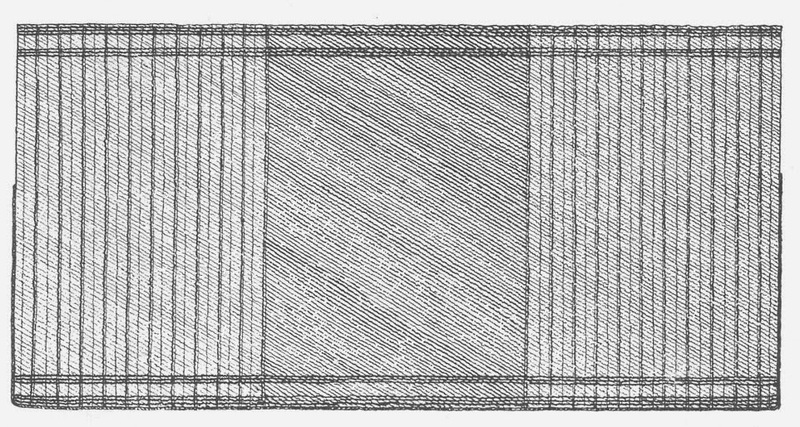 The front is smocked, the drawing clearly shows the opening on one side. The sleeve embroidery is only shown as a strip of color, so it is impossible to tell what technique. Double apron was my second guess, but as for now I'm not well into woman costumes. I'll check those transylvanian costumes! I am Romanian and I just want to let you know that this post is great! 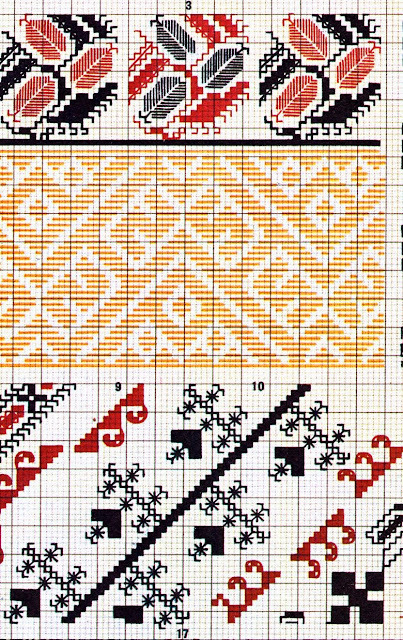 I am glad that you've noticed the differences between the Romanian/Bucovinean motifs vs. Ukrainian ones.